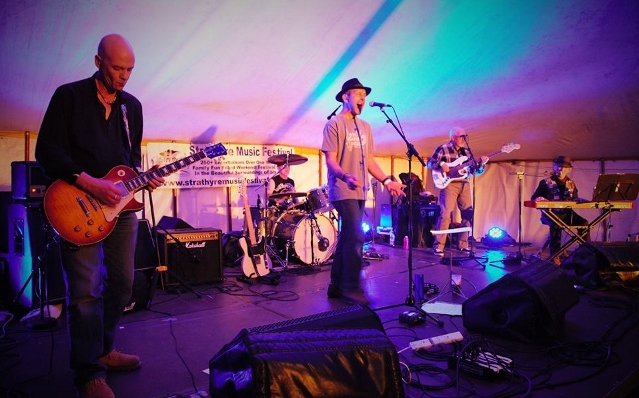 MUDSLIDE are a 5 piece Blues band from the wild west coast of Argyll. With a wealth of professional and semi-professional experience from diverse musical backgrounds and a passion for the Blues , they create foot tapping, spine tingling, stormin' Blues. Their set list encompasses all styles of Blues with songs from Stevie Ray Vaughan to Clapton, Gary Moore to Joe Bonamassa plus some original material and older classics MUDSLIDE prove that the Blues is still alive and well, in fact they are putting life back into the Blues ! With an enviously tight rhythm section, blistering guitar solos, dazzling keyboards and soulful vocals, they are guaranteed to get a place dancing. Available for festivals,pub gigs and parties - you will NOT be disappointed.In fact they have a growing fan base of converts who had no idea that Blues could sound this good. It is not their plan to become world famous , they just love listening to and playing the Blues whilst clutching on to the thin straws of reality!